John’s Sanitation has provided portable sanitation services in Metro Detroit for more than 30 years. Our friendly and knowledgeable staff and competitive prices make us a leading sanitation services provider in the Midwest. John’s Sanitation employs experienced technicians, sales staff and customer service representatives who are dedicated to do whatever it takes to ensure your repairs, maintenance, replacement or rental meet your expectations. Our continual growth and expertise allows us to serve a broad range of sanitation needs. This includes large-scale events, such as festivals and concerts, and the University of Michigan’s football games in Ann Arbor. We’ve provided sanitation equipment for construction projects across the state, including reconstruction projects on Michigan’s major highways. At John’s Sanitation, we stand behind our guarantee and aim to exceed your expectations. Our dedication to the portable sanitation market requires us to take the extra step. We have GPS installed in our truck fleet so we can ensure on-time arrivals and a quality control inspector on our staff so that you can count on your repair or replacement to done right the first time. We adhere to a strict sanitation process for all of our rentals and equipment so you have a clean, worry-free experience. You can count on John’s Sanitation to provide superior service and expertise for your septic system needs, as well as deliver clean, modern equipment to your event or construction site. John’s Sanitation owns more than 2,000 portable sanitation units, including restroom and shower trailers. We’re one of the largest portable restroom providers in Michigan. In addition, we also rent tents, tables, chairs, Dumpsters and roll-offs so that you can rely on John’s Sanitation as your single source for on-site equipment rental. 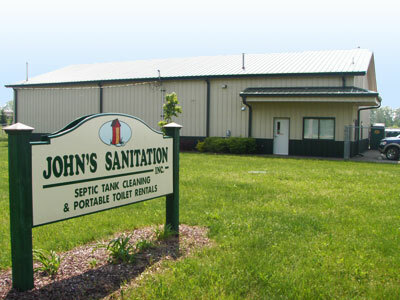 John’s Sanitation is an active member of the Michigan Septic Tank Association (MSTA) and has served southeastern Michigan for more than 38 years. In the spirit of being a good corporate citizen, John’s Sanitation makes every effort to contribute its services to nonprofit organizations, chiefly by donating portable restrooms for fundraising and similar events.